Summer is preserving time, from making chutney & passata to pickled cucumbers and making jam. I have thankfully been given some jars, so I am back on track to get bottling. When I saw Quekes (baby cucumbers) on special I knew I had to make some more Pickles. My dear friend Niina sent me Moomins Cookbook: An Introduction to Finnish Cuisine available here and I have made a couple of things from it, one of the best by far is their recipe for pickled gherkins. Our kids love gherkins, as do we, they make a lovely addition to a Ploughman’s lunch, a quick easy pre dinner nibbles, or as an addition to lunch boxes. We can get them very cheaply here in Australia from tiny baby cucumbers the size of your kids fingers to the large Polish ones. However if I make them myself I know exactly what’s gone into them and there is nothing quite like home made in my opinion. For this batch it almost seemed to take longer to get the sticky goo off my jars than it did to make the actual pickles. 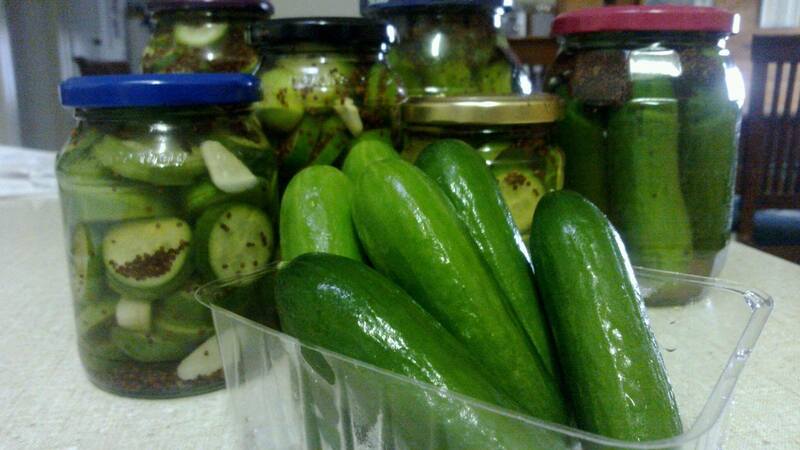 Then you just let time take it’s course and in about a month or two we’ll be enjoying our very own pickled cucumbers. I think you’d be able to use this recipe as a base for other pickled vegies like carrots, cauliflower and onions as well as bread and butter cucumbers.For the amount pictured I double the recipe and had exactly the right amount of liquid. I leave out the horseradish, black current leaves (as I don’t have any) and the dill because it makes my nose itch to the point where I would gladly remove it from my face. You can make it to suit your tastes as well. Some large glass preserving jars or smaller ones if you’re planning on slicing the cucumbers or gherkins. Firstly wash your jars in hot soapy water and allow to soak to remove the labels and any goo from the labels. Once they’re clean, rinse well and place on a tray in the oven and heat for 10 mins at about 180 degrees Celsius. Wash the gherkins well and cut them into slices. Layer the slices in large sterilised jars together with the seasonings. If you like mild gherkins leave out the garlic and horseradish (as I mentioned above I only leave out the horseradish and they’re delicious, not to spicy at all). Simmer the ingredients for the stock. Allow to cool, then pour enough stock into the jars to cover the gherkins. Close the lid tightly and store in a cool cellar or pantry (dark cupboard). I doubled the quantity of stock based on how many cucumbers I had, I also poured hot stock over the cucumbers and microwaved each jar for 30 seconds in order to get the stock hot enough to create a vacuum when you put the lid on. Some people say you don’t need to worry, but I prefer to ensure the jars are sealed properly. Plus I like hearing that little click that happens when the suction forms. Yes you can call me crazy :D.
I hope you love these as much as we do. It’s a little taste of Finland, Thanks to Niina and the Moomins! I think it was a couple of Master Chef seasons ago, Zachie and I were watching Gary make pies. They looked amazing, great for winter and who really doesn’t love a pie? Pies for us were our “we’re home late and the kids need to eat now” meal and I was buying nibble pies aka party pies from Aldi which were great. But in the back of my mind were a couple of things. Firstly they’re not the most nutritious thing ever and heaven only knows exactly what they’re made of. 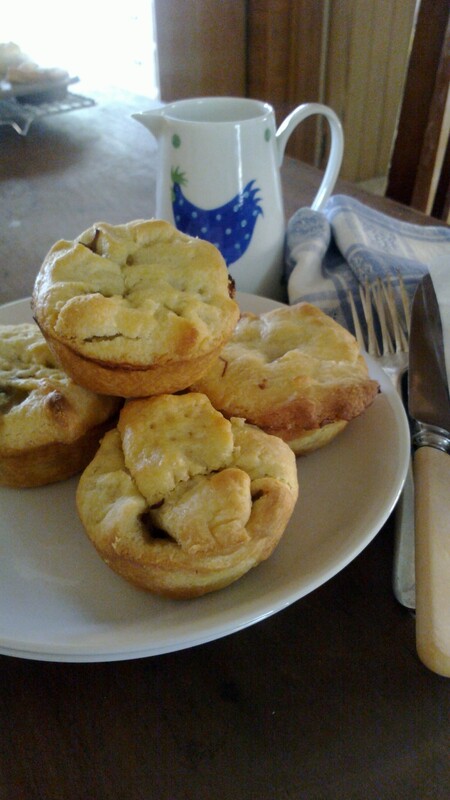 So I thought I am going to have a go at making Gary Mehigan’s pies. You can find his recipe here. Now me being me, it’s very rare that I will follow a recipe to the T unless I am baking in which case you have to as it’s a bit of a science experiment in getting everything to do it’s thing (another story there). Anyway I went to the butcher but he only had Osso Bucco which apparently is chuck steak with the bone. Which will give loads more flavour so I was in. Then today I am about to get everything ready and realise we only have 1 onion and the recipe says 4… argh! Kids aren’t massive fans of onions, had a bunch of spring onions voila, problem solved. I also left out the Guinness and used extra water instead. This recipe took the better part of a day to make, but bear in mind, that includes wrangling 2 rascals, hanging out washing, a bit of procrastinating and realising I added too much water at the start. The results though were amazing and I would say if you’re a confident cook then add the extra water, used osso bucco and let it all cook away, especially for those of you in winter as it’ll warm your house too. We ended up with a delicious sticky stew, where the meat melted away and was rich in flavours. Zachie was taste tester and he said it’s perfect Mummy, Mr Maker, Giggle and Hoot tastic! Which in my book equals winner! Preheat the oven to 180°C fan-forced (200°C conventional). For the pies, add 40ml olive oil to an enamelled cast-iron casserole, then add the onion, garlic and thyme and cook over low heat (use a simmer mat, if necessary) for 40 minutes or until the onion is soft and translucent, stirring occasionally. Increase the heat to medium-high, add bay leaves, carrots & mushrooms and cook until the onion is dark and caramelised. Add the flour & powdered stock and cook stirring often for 3-4 minutes. 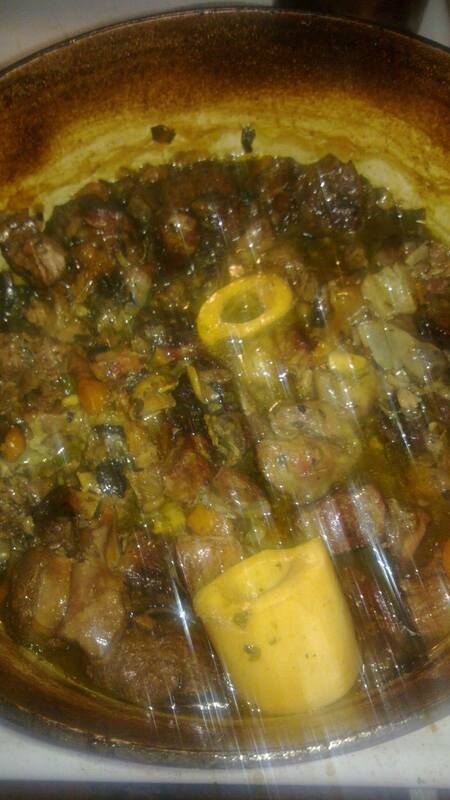 Season the osso bucco generously with salt flakes and ground pepper. Heat remaining 60ml of the olive oil in a large frying pan over high heat, then cook the osso bucco in 2 batches until browned on all sides. Place the osso bucco into the onions and use 2 cups of water to deglaze the beef pan, scraping all the brown bits from the bottom, add to the onions. Pour enough water to cover the beef and vegetables and bring to the boil. Cover with a tight fitting lid, then transfer to the oven and cook for 2-2.5 hours or until tender. Now I forgot that the amount of water required to cover osso bucco is more than what you would need to cover chuck steak so after 2 hours there was still heaps of water so I took the lid off and let it cook for another hour and that resulted in the most lovely stew, the meat was off the bone and lovely and sticky. Damn near perfect. Leave to cool to room temperature. Remove the bones and any visible fat and break up the meat with a fork, squash any large pieces of carrot. Refrigerate until cold. Meanwhile, to make the sour cream pastry, place the butter and flour and a pinch of salt in the bowl of an electric mixer with a paddle or food processor, then blend until the mixture resembles large breadcrumbs. Gradually add the sour cream, mixing until the pastry just comes together. Shape into a disc, then wrap in plastic wrap then chill for at least 30 minutes. 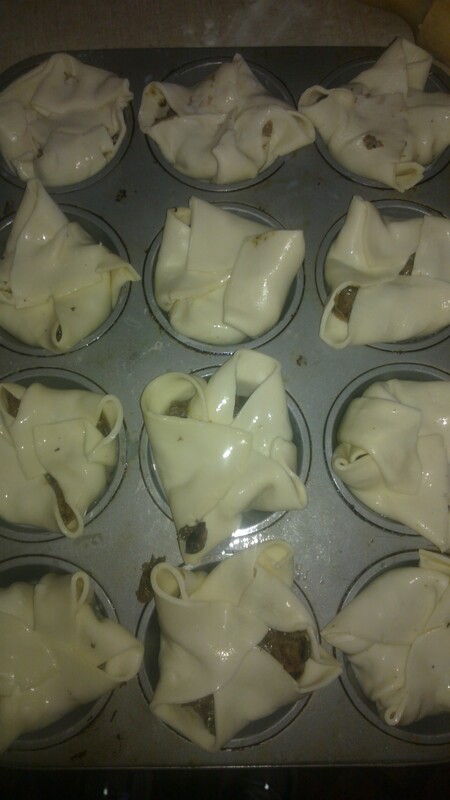 Now at this stage you need to decide what size pies you want, I wanted nibble pie size so I used a muffin tin. I also sprayed it with one of those baking sprays as I am not about to wrestle with the pies to get them out of the tray. 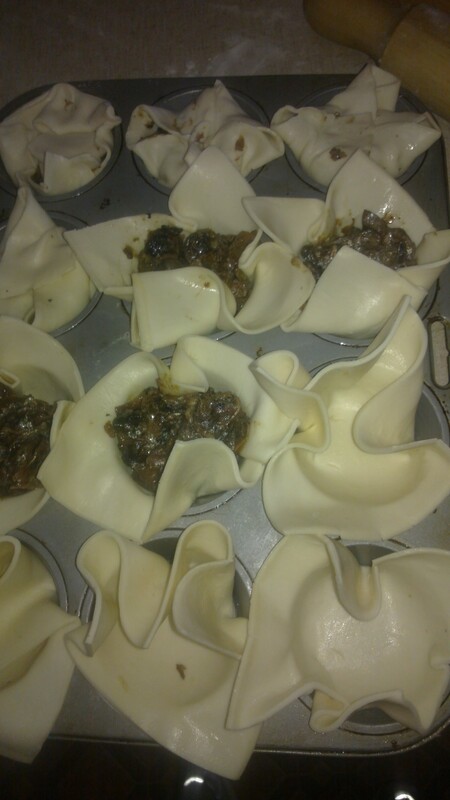 The pastry was quite sticky and as I don’t have a cutter to fit them to the size of the tin I did the next best thing. I rolled the pastry out to about 5-10 mm and cut it to fit and then rolled them slightly to make sure they were big enough to sit up over the sides of the tin. Place a spoonful of the meat into the mould and seal, making sure you crimp the edges together. In the end the pastry sat up enough that I was able to fold it over and use that as the lids with little holes in the corners. This will allow the steam to escape. Brush the pastry tops with egg wash. Bake for 25 minutes or until pastry is golden. Remove from the oven and leave to stand for 5 minutes. Turn out and serve with tomato sauce, if desired. If like me you’re going to freeze the pies you can cook them until they’re just golden and then remove from the oven. 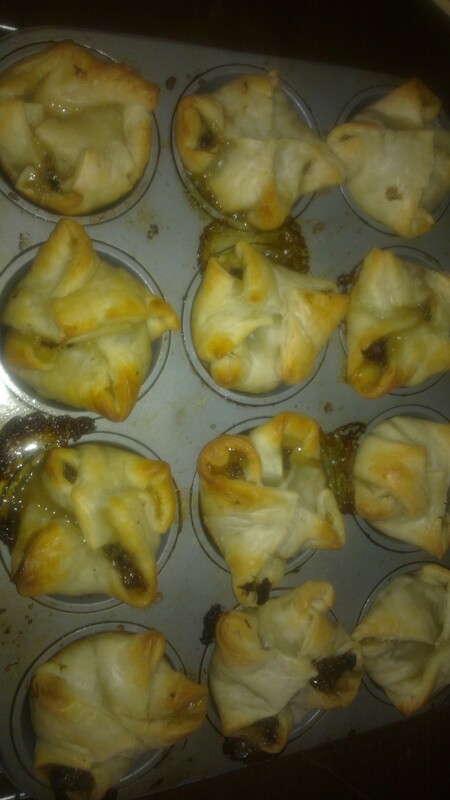 Zachie wasn’t a fan of the pastry, a bit too rich so if you can’t be bothered making your own pastry you can also quite easily use a good puff pastry, which is what I reverted to. I just cut each sheet into 4 squares and waited til they were soft and pliable and folded the corners in over the filling. This recipe made us 30 small pies. I doubled the quantity for the pastry from the original and if you were using bought puff pastry then you’ll need at least 8 sheets. Also if allergies are a concern you can also leave out the egg and just use milk to brush the pastry before placing it in the oven. We are in the midst of holidays at the moment and while the weather is warm it’s certainly not hot. I am not complaining, to me these sunny days are what makes a perfect summer. It’s warm and if you were in a sheltered spot it’d be hot, but the evenings are cool and make for good sleeping. Yesterday was a very lazy day so today we needed to get out of the house and off to the market as we’d used up all our leftovers and we were all going a little bit stir crazy. First stop was Aldi. Now I have sung their praises before and today was no exception. Punnets of strawberries for 99 cents! Yes you read that right. It’s not even worth driving to pick them yourself for that price. I figured these were going to be the eat them now or make something with them kind at that price so the kids and I went over them with a fine tooth comb and just as I was about to remind Sophia to be careful because she dropped a punnet and they opened up we discovered a mouldy one in there – nice one Soph. So with 9 punnets in tow I was prepared to come home and make either Jam or Sorbet. Jam won out as I don’t have an ice cream machine. I removed all the stalks and cut the berries in half and ended up with 1800 grams or 1.8kg of fruit after the kids sampled some. I knew you could make jam with roughly equal quantities of fruit and sugar. I put a saucer in the freezer and as the jam started to thicken I drizzled some onto the saucer and put it back in the freezer for 5 mins. When you can push it with your finger and it leaves wrinkles you know it’s ready. That amount of fruit has yielded a small jar, 4 larger size jars and one enormous jar of jam and a bit extra which we’ll need to use now as I have run out of jars and I am seriously regretting donating my collection of jars to the op shop when we moved! Now all we need are some scones and cream to go with our jam. Happy sunny days! I hope everyone has had a wonderful Christmas and New Year celebrating with those nearest and dearest. I will over the coming days post some pictures and recipes from our Christmas Lunch. For now though, I wanted to share a quicker than quick, tasty and warming snack, lunch or dinner. Wonderful if you’re feeling slightly seedy from a larger than life New Years celebration. Particularly wonderful if you’ve had a lazy day and really can’t be bothered cooking much. I fall into the latter category. We had a wonderful evening celebrating New Years with very dear family who I consider friends as well. The kids adore each other, there isn’t a moment of fighting which is so rare for young children, conversation flowed as did laughter, joy and happiness! So Cheese on toast anyone? Some yummy bread – I used Taylors Grainy bread which is wholemeal with bits, but you can use what ever you like. Tasty Cheese, a good quality vintage cheddar or Mersey valley if you want to go up market. Leftovers, Ham, chicken, capsicums, spring onions aka scallions or a Spanish (Red) onion, olives finely chopped, normal or cherry tomatoes. You can really use anything you like. For the kids I just toasted the bread first and then placed the cheese on the toast in slices and put it under the grill until it was melted and golden. 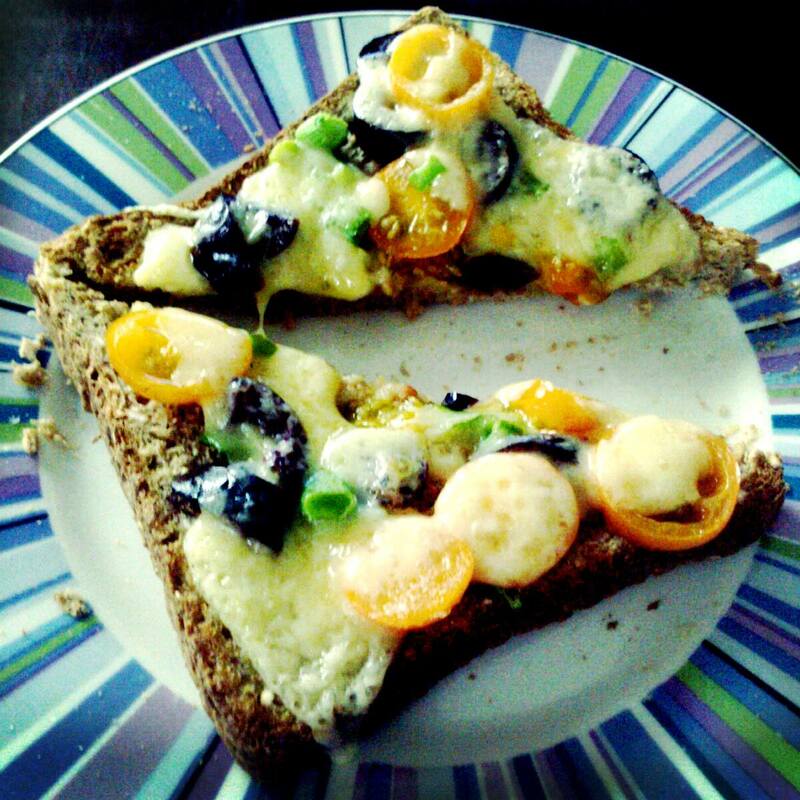 For us I used up the wilting spring onions, some black olives and yellow cherry tomatoes, all sliced. I put a bit of everything on the toast topped with cheese and then under the grill for about 5 mins or so. Years ago ‘The Age’ published a recipe for a Trifle made from Panetonne, Raspberries and Orange juice. For some reason I always think I haven’t kept the recipe, but I have and now that I’ve dug it out, I remember it was in the Saturday mag which is an insert into the paper. Quite simply this is one of my FAVOURITE desserts! It’s so good, that even though I keep thinking, no, I won’t make it this Christmas, looking at it, I think how can I not? I leave out the alcohol and don’t bother with the Meringue and use whipped cream instead. But I will give you the full recipe and you can decide what you prefer. 500g Raspberries (Frozen is fine) – you can also use a mix of berries, but the raspberries are gorgeous. 1kg Panetonne sliced into 1-2cm rounds (1/2 an inch) – you will find these at any good Italian grocer, the market etc and in Australia you should get a very nice one for no more than $10 I go for one with sultanas etc in them. Heat the sugar and water in a small saucepan until the sugar has dissolved. Cook until syrup has reduced to about a cup. 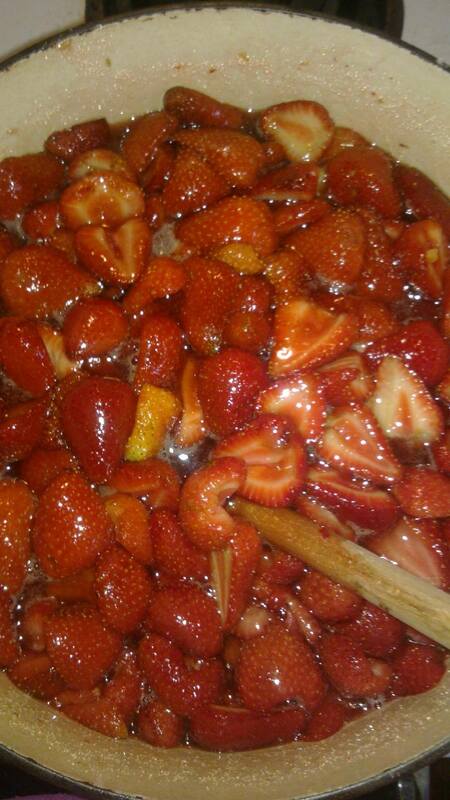 Remove from the heat and add a handful of berries and the liqueur, mix well and set aside. Cut the remainder of the berries into small pieces and mix with the orange zest. If the raspberries are small or you’re using frozen berries you won’t need to cut them up. Whisk the egg yolks and sugar in a stainless steel bowl for 5 minutes until creamy, add the sifted flour and stir until smooth. Heat the milk and vanilla bean in a saucepan to just before boiling point. remove vanilla pod, then slowly whisk the hot milk into the egg mixture. Return the mixture to the saucepan and whisk until thick over a steady heat – Do NOT walk away! Allow the mixture to cool for 2 minutes before removing it from the stove. Place the Crema Pasticcera (Custard) into a clean bowl and cover with a piece of baking paper that is tucked down into the bowl, touching the custard which prevents the formation of a skin, refrigerate until cold. 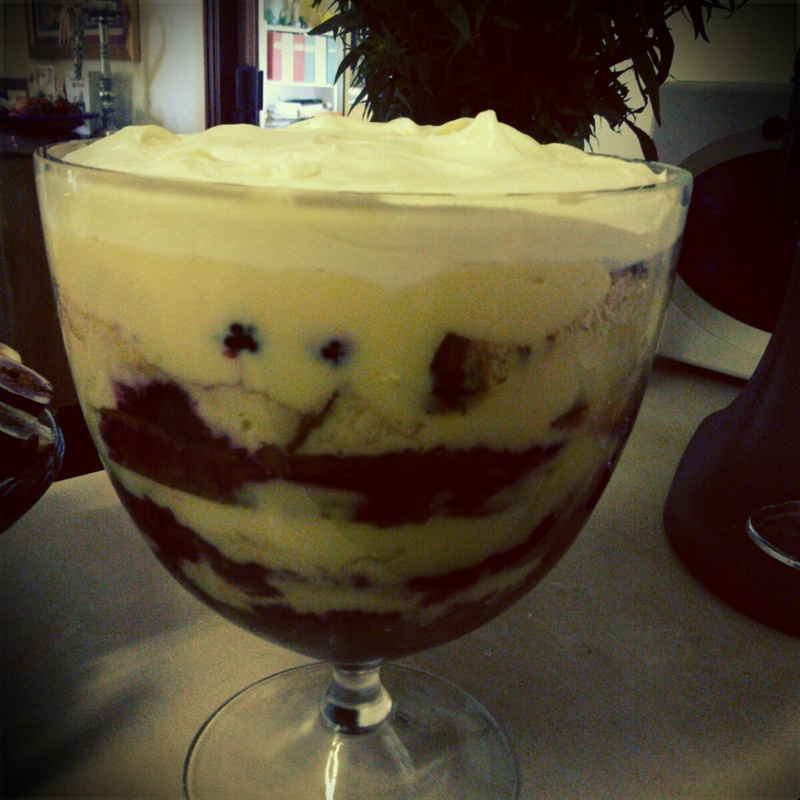 I think ideally you want to assemble the trifle in a glass bowl so you can see the layers. 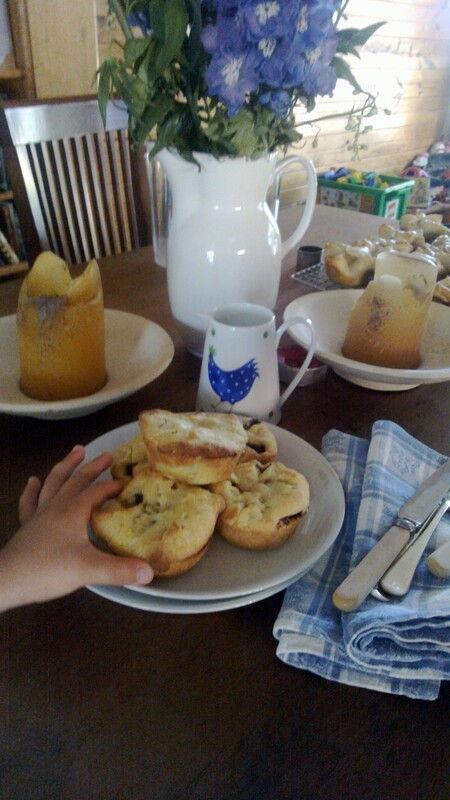 Place a layer of panetonne around the bottom of a large bowl, then pour over 1/2 the berry syrup. Place a layer of custard over the panetonne and then some of the berries and repeat the layering process until you have used up all your ingredients. Whip the egg whites and sugar until they form stiff peaks. Pipe or spoon the meringue over the top of the last layer in the bowl and run a flame torch over the meringue till it begins to colour. This is where I substitute the meringue for whipped cream, not because I don’t have a blow torch, but because it’s already RICH enough and I am always a bit hesitant about whether the meringue will be cooked. What to cook when you work full time? This week marked my first week back at full time work since our children were born. I have managed to work 3 days a week roughly 9-4 for the last 6 months, but the opportunity came up for a short term full time contract and I thought this could be our litmus test to see how everyone copes with me not being home until 5 or 6pm. So I put it to you dear readers, what are your tips and tricks for ensuring everyone still eats well when you’re not there to oversee it. I am thinking things like ready made meatballs, Spaghetti bolognaise, but that’s where my freezer food ends and I wonder how can I pre make things like rice, risotto etc. Is it time to invest in a slow cooker? I could make casseroles and things like that, but Hubby isn’t a fan. Usually we’d just have a barbeque with salad and rice or something similar, but it seems they only like my rice and H can’t quite get the hang of it.. First world problems I know, but what tips and tricks do you have up your sleeves.